Organisations often fail to achieve competitive advantage in the market, although having resources and capabilities, just due to lack of appropriate strategies. Strategies are the key instrument now-a-days used by the most HR managers to avail the best opportunities over the competitors and achieve the organisational goals thereby. Thus, HR experts presently stress on the need of proper planning to formulate the best strategies which will guide the managers and the employees to attain the goals through ensuring competitive advantage in the market. Strategic plans are the fruit of this requirement and thought. 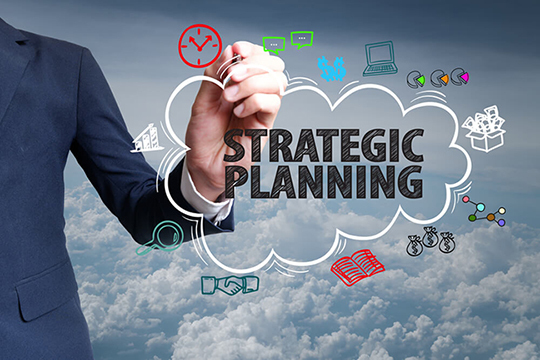 Strategic plans are those which are designed to achieve the comprehensive goals of the organisation, so that to ensure the execution of organisation’s mission (Rezaian, 2008). This type of planning is prepared with foresight and in an organised procedure. The aim of strategic planning is assisting organisations to win competitive advantage in the market. Now it has been proved and beyond any doubt that strategic planning is the key HR management process to achieve goals and objectives excellently. By strategic planning a set of future courses of actions are defined that facilitates to deal effectively with rapidly changing circumstances, predict future problems and opportunities, provide employees with clear understanding of the objectives and directions for the future of the organisation and increase employee motivation, satisfaction and consequently ensure higher employee engagement in the organisation to build teamwork and expertise. The triumph of a strategic plan relies on its ultimate execution. Yet the employees of the organisation by whom the plan will be implemented on a commonplace are often positioned at the end of the process to know about the details of the plan. As a result, it becomes harder for the employees to get into the plan and extract the fruit of it. Thus, while preparing strategic plan, the HR management should create scope for the employees to get engaged from the very beginning of the process. It will definitely ensure higher employee engagement in the organisation. In preparing HRM engagement strategy, strategic planning plays key role to persuade the employees’ performance to achieve advantage. This framework illustrates the way organization factors such as HR practices and organisational climate can collectively influence the employee engagement. These forces drive the job factors such as supervisor support, autonomy etc. and the motivation factors like job satisfactions, commitment at individual level and team performance and team innovation at teamwork level to ensure employee engagement in the organisation. As a result, the outcomes (competitive advantage) happen both individual and teamwork level. The employees being motivated engage more to the organisation and the team wins the competitive advantage. The engagement strategy that was taken earlier, later on comes out with the achievement of success. The writer is pursuing MBA in Human Resource Management, North South University.